The Holter monitor is a type of portable electrocardiogram (ECG). It records the electrical activity of the heart continuously over 24 hours or longer while you are away from the doctor's office. A standard or "resting" ECG is one of the simplest and fastest tests used to evaluate the heart. Electrodes (small, plastic patches that stick to the skin) are placed at certain points on the chest and abdomen. The electrodes are connected to an ECG machine by wires. Then, the electrical activity of the heart can be measured, recorded, and printed. No electricity is sent into the body. Natural electrical impulses coordinate contractions of the different parts of the heart. This keeps blood flowing the way it should. An ECG records these impulses to show how fast the heart is beating, the rhythm of the heart beats (steady or irregular), and the strength and timing of the electrical impulses. Changes in an ECG can be a sign of many heart-related conditions. Your healthcare provider may request a Holter monitor ECG if you have symptoms, such as dizziness, fainting, low blood pressure, ongoing fatigue (tiredness), and palpitations and a resting ECG doesn’t show a clear cause. You wear the same kind of ECG electrode patches on your chest, and the electrodes are connected by wires to a small, portable recording device. Certain arrhythmias (abnormal heart rhythms) may occur only now and then. Or, they may occur only under certain conditions, such as stress or activity. Arrhythmias of this type are hard to record on an ECG done in the office. Because of this, the healthcare provider might request a Holter monitor to get a better chance of capturing any abnormal heartbeats or rhythms that may be causing the symptoms. Some Holter monitors also have an event monitor feature that you activate when you notice symptoms. You will get instructions on how long you will need to wear the monitor (usually 24 to 48 hours), how to keep a diary of your activities and symptoms during the test, and personal care and activity instructions, which include keeping the device dry while you are wearing it. Why might I need a Holter monitor? There may be other reasons for your healthcare provider to recommend the use of a Holter monitor. What are the risks of a Holter monitor? The Holter monitor is an easy way to assess the heart’s function. Risks associated with the Holter monitor are rare. It can be hard to keep the electrodes stuck to your skin, and extra tape may be needed. It may be uncomfortable when the sticky electrodes and tape are taken off. If the electrodes are on for a long time, they may cause tissue breakdown or skin irritation at the application site. There may be other risks depending on your specific medical condition. Be sure to discuss any concerns with your healthcare provider before wearing the monitor. Close proximity to magnets, metal detectors, high-voltage electrical wires, and electrical appliances such as shavers, toothbrushes, and microwave ovens. Cell phones and MP3 players can also interfere with the signals and should be kept at least 6 inches away from the monitor box. How do I get ready for a Holter monitor? You do not need to fast (not eat or drink). What happens during a Holter monitor? 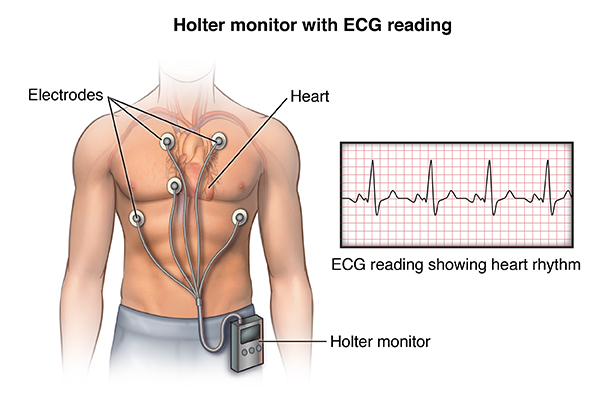 A Holter monitor recording is generally done on an outpatient basis. Procedures may vary depending on your condition and your healthcare providers practice. You will be asked to remove your clothing from the waist up so that electrodes can be attached to your chest. The technician will ensure your privacy by covering you with a sheet or gown and exposing only the necessary skin. Electrodes will be attached to your chest and abdomen. The Holter monitor will be connected to the electrodes with wires. The small monitor box may be worn over your shoulder like a shoulder bag, around your waist, or it may clip to a belt or pocket. Find out if you will have to change the batteries in the monitor. Be sure you know how to do it and have extra batteries on hand. Once you have been hooked up to the monitor and given instructions, you can return to your usual activities, such as work, household chores, and exercise, unless your healthcare provider tells you otherwise. This will allow your healthcare provider to identify problems that may only occur with certain activities. You will be instructed to keep a diary of your activities while wearing the monitor. Write down the date and time of your activities, particularly if any symptoms, such as dizziness, palpitations, chest pain, or other previously experienced symptoms, occur. What happens after a Holter monitor? You should be able to go back your normal diet and activities, unless your healthcare provider instructs you differently. Generally, there is no special care after a Holter monitor recording. Tell your healthcare provider if you develop any signs or symptoms you had before the recording (for example, chest pain, shortness of breath, dizziness, or fainting).